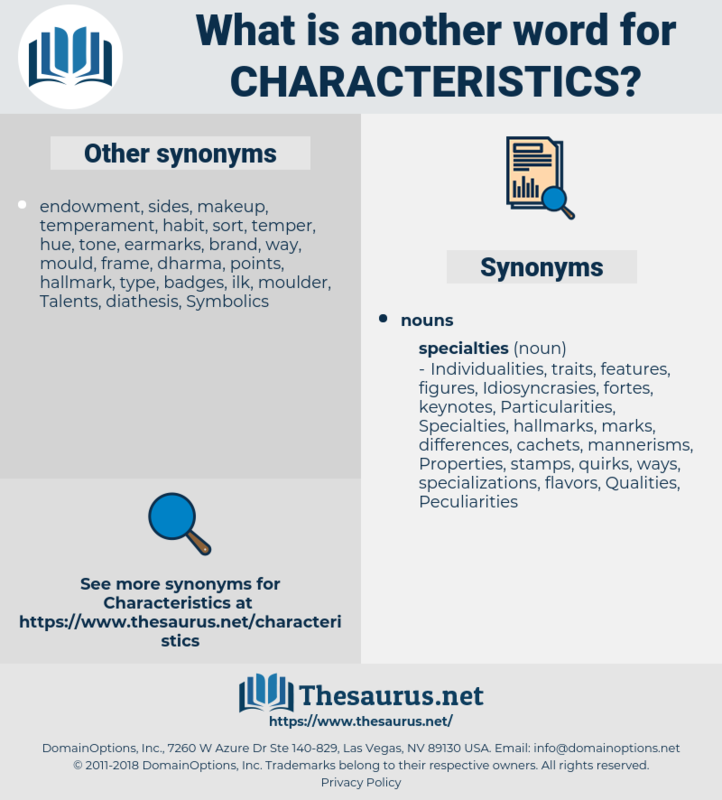 What is another word for characteristics? Peculiarities, Particularities, Idiosyncrasies, traits, features. particulars, details, identification, components, requirements, customary, terms, Habits, emphasis, identifying, methods, identify, general, section, estates, information, script, identified, marking, item, side, arrangements, treaty, points, manner, procedures, ownership, modalities, des, smart, overview, forest, print, profiling, data, font, block, unsatisfied, profil, text, age, query, characterisation. specific, specifics, Chars, factors, parts, principles, circumstances, purposes, check, respects, demographic, Demographics, Italics, effects, Measures, pre-conditions, determinants, times, similarities, dynamics, behaviour, behaviours, Specialties, indicators, shapes, topics, Specialities, Strains, special, constraints, threads, differences, characterizations, issues, metrics, benchmarks, variables, distinctions, patterns, manifestations, considerations, structures, graphics, Tendencies, sensitivities, indications, Behaviors, specificities, changes, Styles, prerequisites, constituents, trappings, interests, streams, assets, FACETS, Diversities, types, coordinates, identifiers, symptoms, discrepancies, shortcomings, variations, natures, ways, things, Personalities, trends, themes, labels, relationships, Virtues, contours, colors, ingredients, Standards, belonging, settings, Abnormalities, pieces, strengths, completely, implications, motives, Contradictions, formalities, outlines, colours, pillars, values, strands, skills, sizes, specs, devices, demonstrations, definitions, symbols, scripts, facts, sentences, outcomes, Operators, dashes, Categories, Ideas, Identities, particularisms, letters, Frequencies, subjects, enhancements, practices, marks, connotations, Fisheries, reasons, Deficiencies, landmarks, Abilities, Criteria, responsibilities, commonalities, Attitudes, inputs, markings, alphabets, Realities, items, defects, consequences, norms, signs, shares, homesteads, Duties, parameters, merits, bars, returnees, highlights, directions, sexual, moves, cases, Classes, preconditions, provisions, Examined, sharing, innovations, limitations, sides, Prescriptions, results, PROSPECTS, weaknesses, Difficulties, Tests, suitabilities, digits, contents, advantages, savings, overtones, samples, Treaties, products, systems, conditions, customs, functions, Areas, Dependencies, efficiencies, fundamentals, premises, nuances, minds, Strokes, descriptions, privileges, Indices, users, Tracks, approaches, dots, needs, rules, sets, influences, assumptions, peoples, leaders, kinds, VISAS, Fingerprints, developments, Faces, qualifications, crossing, concerns, contexts, materials, words, quirks, endpoints, Possibilities, Studies, Roles, Anomalies, Ones, findings, drivers, lengths, Lives, demands, grades, events, typologies, trains, prints, positions, honours, auditors, Nationalities, tags, contractors, restrictions, services, proceeds, competencies, costs, performances, protests, fonts, wages, graduations, outputs, causes, comrades, reviewed, Capabilities, conflicts, Forms, IMPACTS, utilities, Undertakings, knows, holdings, farms, conductors, community, Facilities, framework, Foundations, backgrounds, requests, Capacities, awards, PORTS, employees, powers, views, claims, arts, Salaries, problems, Hauls, concepts, Wonders, Plays, grounds, reforms, benefits, mode, entrepreneurs, contributions, follows, communists, tows, account, accounts, women, guys, paragraphs, situations, particulars, details, goods, LINEs, Bodies, lands, components, requirements, terms, Habits, methods, identify, estates, arrangements, points, procedures, modalities, data. numeric, highlights, alphabet, lettering, script, print, font, block, Characterizing, characterisation, uniqueness. characterized, characterised, selected, associated, removed, specified, defined, used, proposed, expected, found. 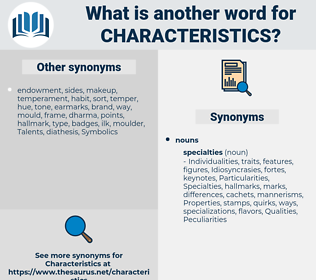 characterizes, regards, works, requires, means, makes. Although still half a block away, the national characteristics of the passenger were sufficiently apparent. It was one of Gordon's chief characteristics that he usually did well while others failed, and this term the Colts for some reason or other never properly got together.